If you are looking for the best selection of online pub fruit machine and slot games then Ladbrokes Casino is the place to play. The site is packed with all types of different games that are designed to suit all budgets. The games themselves are nicely grouped together. So if you're after jackpots just click on the ‘Jackpot' tab. There are over 30 featured games with progressive jackpots. There is also a Movies & TV section. This is loaded up with titles from all your favourites. Matrix, Gladiator, Marilyn Monroe, Little Britain and The Dark Knight are all there. Like all good online casino's Ladbrokes is continually adding new and exciting games. They even have a New Games section so check it out if you want to try a new gaming experience. The Top Games section is where you will find all of their most popular titles. New and old, these online slots continue to attract players month after month. Grab a great new customer welcome bonus at Ladbrokes Casino. Whether you like to play on desktop PC, Tablet or Mobile you can get the most from Ladbrokes as all devices are supported. If huge jackpots are your aim then Ladbrokes delivers as there are some cracking progressive jackpot slots available. Ladbrokes offer a host of great deals every week so if its the latest promo you're after check them out. Ladbrokes Casino is always evolving. New online slot games get added all the time and the range of progressive jackpot games is amazing. We love that they keep updating their promotions and offers and all of them are nicely laid out and easy to understand. There is also a loyalty programme that rewards you with comp points. Every time you turnover £10, 1 point is automatically added to your Comp Point balance. Collect enough points and convert them into instant cash. That's the kind of loyalty scheme we like! The thing I do really like about Ladbrokes Casino is the way you can play all the games for free. All of the games are available in Demo Mode so no need to spend any cash unlike you like the game first. Of course, you can't win real money either but the fun factor is just the same. And for those on the go, there is a dedicated mobile app for the casino. 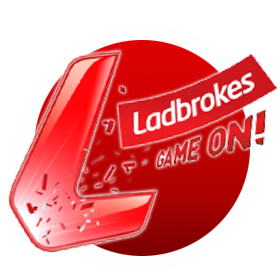 Within that is a Ladbrokes Area to keep up to date with all the latest promos and offers so you never have to miss out.